CE approved ( patent No. 85591 ). 1. 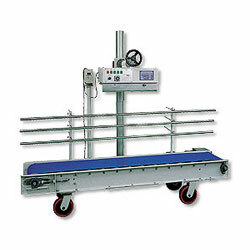 The most heavy duty model in vertical sealer. 2. Manual or powered elevation (optional). 3. Features close to CC-6202. 5. Height of conveyor from floor 400mm. (Custom height is available). 6. Seals bag height range 500-1000 mm. 7. 3 phase, 220V power control. 8. Standard feed fence length is 200cm. Extended length (optional).